Britta Ambauen's handmade necklaces symbolize six personality types through colorful gemstones. Britta Ambauen loves to infuse her jewelry with the ideas she contemplates often. In this case, it's the archetypes that represent the personalities she most admires. Each of Britta's six gemstone necklaces celebrates a quintessential personality, like the knowledge-driven Scholar (symbolized by purple sodalite), the visionary Entrepreneur (peach moonstone), and the curious Innovator (blue lace agate). Whether you pick a gem to remember your aspirations or to stay connected with the person you are at heart, Britta's designs honor the strengths that help you shine. 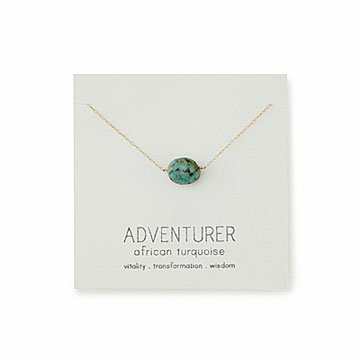 They're also thoughtful gifts for those you admire, like your Hero (lemon quartz), Nurturer (pink Peruvian opal), or fellow Adventurer (African turquoise). Handmade in Seattle, Washington. Stones Vary: .1" - .2" in Dia, Chain: 18"
Bought this as a gift and she absolutely loves it!